Find Prescription Drug Savings in Your Area. MyCityRx offers prescription drug savings and discounts in thousands of U.S. cities. Simpy enter in your city below to quickly find the best drug coupons at over 68,000 pharmacies nationwide! Can't Find Your City? That's OK! 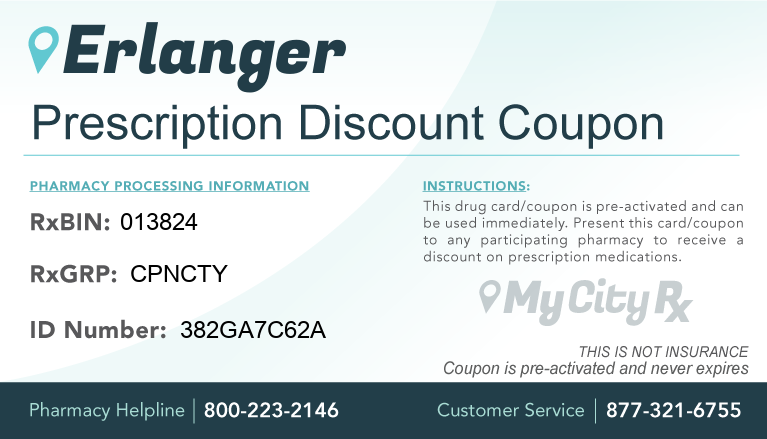 The MyCityRx Prescription Discount Coupon can still be used at any participating pharmacy, no matter where you are. Select an option below to recieve your free drug coupon. MyCityRx connects you to free prescription medication savings at over 68,000 pharmacies in cities across the United States. MyCityRx is partnered with companies that negotiate discounts directly with the pharmacies and helps uninsured and under-insured people afford their prescription needs by offering the best free discounts available. Simply print a drug coupon from this website, take it to the pharmacy with your prescription, and lower your medication costs! Step 1: Search for a city and find a free drug coupon for your area. Step 2: Take your free drug coupon to the pharmacist with your prescription. Step 3: Save up to 75% on your prescription costs at point of sale!